New Delhi, Jan 25, 2018 : The Goods and Services Tax (GST) revenue collections for December witnessed a rebound to Rs 86,703 crore (till January 24), reversing the sliding trend seen in the past months, the Ministry of Finance tweeted on Thursday. The GST revenue collections from composition scheme dealers also increased for the October-December quarter to Rs 421.35 crore as against Rs 335.86 collected during the July-September quarter. “A total of 9.25 lakh returns were filed by composition dealers for October-December quarter paying a sum of Rs 421.35 crore as GST. A total of 8.10 lakh returns were filed for July-September quarter by composition dealers paying a total of Rs. 335.86 crores as GST,” finance ministry said. The total taxpayers under the new indirect tax regime of GST also reached the one-crore mark. “One crore taxpayers have been registered under GST so far till January 24, 2018 of which 17.11 lakh are composition dealers which are required to file returns every quarter. 56.30 lakh GSTR 3B returns have been filed for the month of December, 2017 till 24th January, 2018,” it said. The rise in GST mop-up for December will bring in some relief for the government’s finances on the indirect tax front. GST collections had been declining since October, with the mop-up for November slipping to Rs 80,808 crore (as on December 25), the lowest since the July 1 implementation of the indirect tax regime. 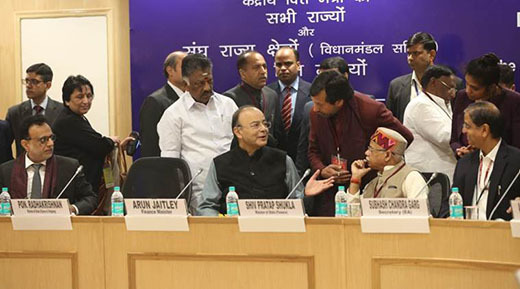 The impact of GST rate cut on over 200 items that became effective from November 15 was reflected in the month’s collections, which were about 14 per cent lower than the collection of Rs 94,063 crore recorded for July (as on August 31) and about 11 per cent lower than the projected monthly target of Rs 91,000 crore. The government had garnered Rs 83,346 crore as total GST revenue for October (as on November 27), Rs 92,150 crore for September (as on October 23), Rs 90,669 crore for August (as on September 26) and Rs 94,063 crore for July (as on August 31).